So you’ve finally made the excellent decision to start at home hair loss treatment sessions by investing in the Theradome LH80 PRO. No more messy creams, no more visits to hair restoration clinics. Pressing the button of your laser hair growth helmet twice-a-week is all you need to do for your laser hair therapy to work at its best. Right? Not Exactly. Why settle for good results when you can achieve fantastic results? What other tools should you arm yourself with, on top your laser hair growth helmet? Let’s examine this question more closely. All mammals, including humans, have sebaceous glands on their skin. These secrete an oily type of viscous matter called sebum. Although this may not sound very appealing, sebum is essential for lubricating and waterproofing our skin. The waterproofing bit is more essential for our furry companions. We have the advantage of umbrellas to protect us from the rain after all. However, it still helps to understand this in the context of laser hair therapy. Did you know that the Chinese were the first to coat parasols with wax to deter rain? Sebum works the same way. It works as a protective, waterproof coating on your skin. It particularly plentiful in our faces and scalps. Does Inflammation Cause Hair Loss? The term “inflammation” is never really associated with a positive outcome. After all, who wants to be inflamed? So let’s take a look at what causes inflammation and how that impacts hair loss. Several factors can trigger inflammation, and an overproduction of sebum is one of them. This can occur if you have a hormone imbalance. Sebum clogs your pores as it oozes out, leading to pimples on your face if you’re in your youth or scalp inflammation if you’re older. This is why teenagers get acne and mid-aged people go bald. Other inflammation-causing conditions include dermatitis, psoriasis, ringworm, seborrhea, eczema, and a rare, genetically-passed on disease known as frontal fibrosing alopecia. You can potentially slow this type of hair loss with certain medications, at-home treatments, and laser hair therapy. However, we need more clinical studies and research to fully test their efficacy. Additionally, fungus is also clinically proven to cause inflammatory responses. Unfortunately, it often resides between the epidermis and dermis junctions of the scalp. Yes, you read this right. Fungus– the same kind that can spread in your toenails as athlete’s foot and can be caught with simple human contact. 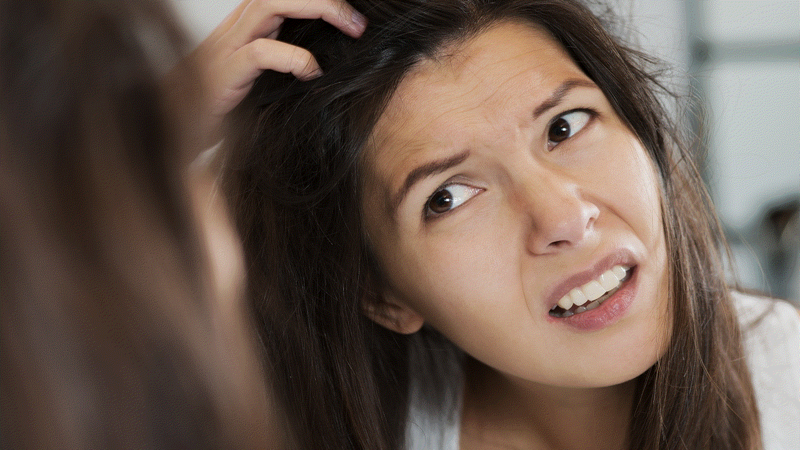 In fact, most people have scalp fungus and don’t know it. If you’ve just reached for your mirror, please put it back because you can’t see fungus with the visible eye. You can only see its unfortunate consequences, which is dandruff. What you can do, however, is eradicate the invasive species. In the case of nails, we look to an OTC medication (a compound called tolnaftate). In the case of hair, you are prescribed a synthetic antifungal medication in shampoo form. The three most effective ones belong to the azole family and consist of climbazole, ketoconazole and miconazole. To summarize any inflammation to the scalp, regardless of its causes, exacerbates hair loss. This is where using your laser hair helmet comes in, since laser hair therapy has been proven to decrease inflammation. To fight off this inflammation, and increase the efficiency of your laser hair loss treatment sessions, it is thus crucial to incorporate a shampoo regimen that addresses all inflammation and fungus issues properly when purchasing the Theradome LH80 PRO.